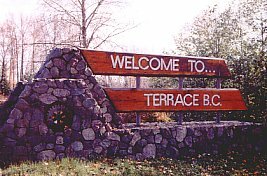 Terrace Part of the BC Adventure Network. Over a million web site visitors annually ! Fishing, adventures, lava beds and a chance to see the rare Kermode bear are but a few of the enticements to visit Terrace. 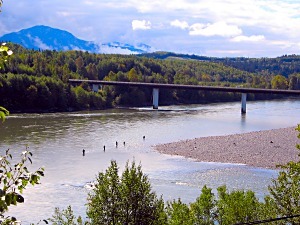 Anglers migrate to Terrace to challenge the legendary steelhead and spring salmon of the Skeena River. There are also a multitude of opportunities for those who enjoy swimming, boating, camping and hiking. The area is also a naturalists delight, with examples of different types of trees, plants and wildlife including the elusive Kermode bear and such birds as the rare trumpeter swan. 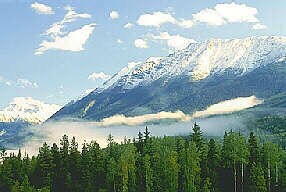 Visitors can also take the opportunity to relax in the Mount Layton Hot Springs just 22 km (13 mi.) south of Terrace. There are a variety of locations where you can experience the history and culture of the area. 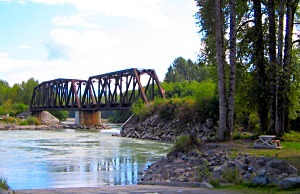 Heritage Park gives you a glimpse of the history of Terrace's early settlers while the Kitselas Canyon and the village of Kitsumkalum enable one to find out more about the First Nation's history in the area. There are adventures and amazing sights to see by driving in any direction from Terrace; 100 km (62 mi.) to the north will bring you directly into the middle of the country's youngest lava flow. The desolate moonscape of the lava beds, and the contrast of the breathtaking scenery around it, promise to make your trip an exceptional one. Your trip east is a step back in time. As you follow the Skeena River toward the Hazeltons, you will experience the ancient traditions of the aboriginal people and the more recent history of the modern settlers. 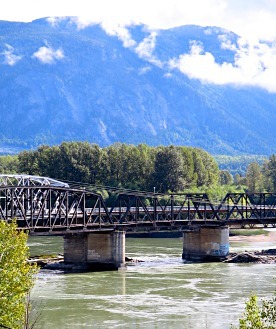 The west coast's longest inland fjord is less than an hour's drive south while a trip west promises an experience of snow capped peaks and the beauty of the Skeena River and the good chance for wildlife viewing. Accommodations: There are a variety of hotel/motel accommodations in the area along with private and provincial park campsites. Many lodges and resorts are located within short distances of the city. Recreation Facilities & Activities: golf course; hot springs resort; aquatic centre; tennis courts; curling and skating rink; hiking; biking; fishing; camping; swimming; wildlife watching; "flightseeing"; horseback riding; boating/canoeing; ski resort.